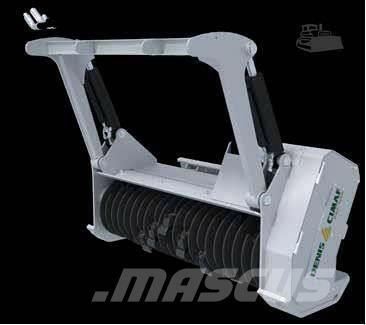 Autres informations Description: The DAF is an industrial high-power forestry brushcutting-mulching system that can be installed on most compact loaders or other dedicated forestry carriers. DAF brushcutters and mulchers are designed for vegetation control work. - Variable displacement, axial-piston motors that minimize overheating and improve re-acceleration. - Industrial cogged belt drive system that prevents slippage and reduces effort applied to bearings compared with V-belts, for longer bearing life. - Protective rings that limit the size of the bites and considerably reduce risks of breakage on the knife holders. - Heat-treated, bolt-on forged knives that deliver maximum resistance to impact and abrasion, and that can be sharpened right on the unit. - Easy-to-replace knives: A single nut and bolt holds the knife in place. Replacing worn knives is a very easy. - With the high speeds and forces involved in industrial mulching, even the hardest steel frame is subject to wear and tear. This easy-to-replace, bolt-in wear liner extends the lifetime of the unit by protecting the frame. Sur Mascus France, vous pouvez trouver un/une autre [Other] DENIS CIMAF DAF150D. Le prix de ce/cette [Other] DENIS CIMAF DAF150D est de - et il a été fabriqué en 2018. Cette machine est visible sur Hickory, Mississippi en/au États-Unis. Sur Mascus France, retrouvez des [Other] DENIS CIMAF DAF150D et bien plus de modèles de autre.